Frederick the Great (1712-1786) left his mark on Europe in many fields: war, music, politics, architecture, language, philosophy, and nutrition. His presence is most apparent at Potsdam in Germany, where he built the Sanssouci Palace and the Neues Palais. These buildings and their maker have also had an impact on the Wellcome Library’s collections. Willingly and without regret I return my life to beneficent Nature, which has graciously lent it to me, and my body to the elements of which it consists. As a philosopher have I lived, and as such will I be buried, without a display of mourning and without ceremony. However, his wishes were ignored, and an elaborate mausoleum was built in the Potsdamer Garnisonkirche, a baroque church. 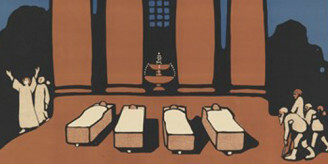 Both church and mausoleum have since been destroyed, but the entrance to the crypt containing his tomb is shown in this watercolour. The entrance to the crypt is on the right, below the pulpit. 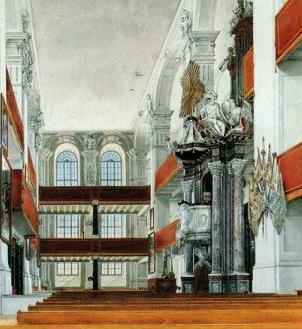 Watercolour of Potsdamer Garnisonkirche, showing the entrance to the crypt on the right, below the pulpit. The arched iron gates to the crypt that are just visible in the watercolour are prominent in an aquatint produced in 1806 to commemorate an historic nocturnal visit to the tomb (below). The crypt has been unlocked by the verger to admit Tsar Alexander I of Russia. 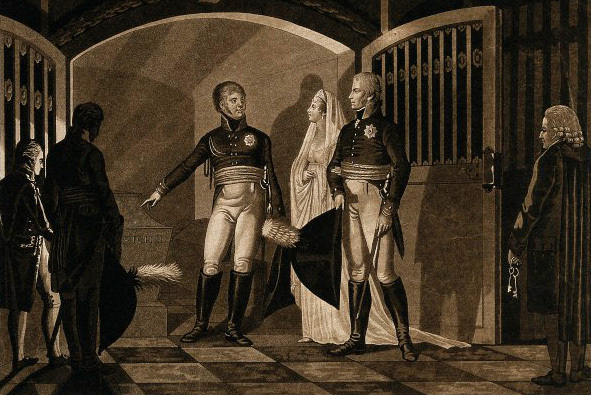 To the right of him stand his hosts, Frederick’s great nephew, Friedrich Wilhelm III of Prussia, with his wife Luise von Mecklenburg-Strelitz. The Tsar stands on the left pointing to Frederick the Great’s tomb and simultaneously admiring the profile of everyone’s darling, Queen Luise. Alexander’s visit occurred on the night of 4-5 November 1805. On 14 October 1806 Prussia was defeated by Napoleon, and the friendship between the Prussian King and the Tsar enabled Friedrich Wilhelm and Luise to seek Alexander’s protection in East Prussia. Tsar Alexander’s visit to the tomb of Frederick the Great was a popular subject for artists. Others who represented it include Franz Ludwig Catel (1778-1856), while Heinrich Anton Dähling (1773-1850) depicted both Tsar Alexander’s visit in 1805 and Napoleon’s visit to the same tomb almost a year later in 1806. Frederick’s tomb was removed in 1943 (before the church was bombed in 1945) to Marburg, and in 1991 his remains were returned to Potsdam, to the ‘philosopher’s grave’ that he had requested in the first place: a simple flat gravestone marks the spot, engraved “Friedrich der Grosse”. Well-wishers paying tribute to the king today lay on his grave not only wreaths or bunches of flowers, but also potatoes. The reason for associating Frederick with the potato was that he issued fifteen decrees concerning potatoes. 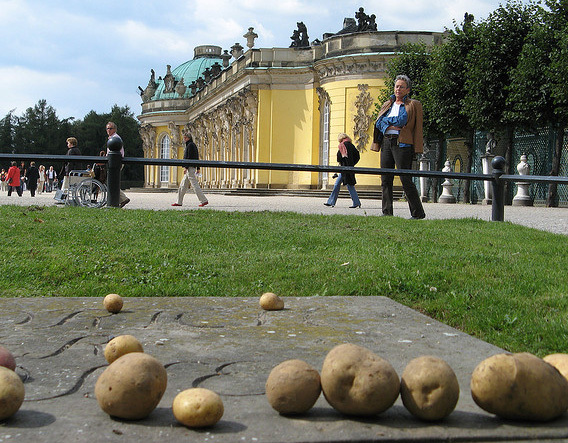 As shown in the exhibition König und Kartoffel at Potsdam last year, the potato was already known in Germany, but was not exploited as a foodstuff because varieties of the plant were known more for their decorative value. Another reason was the religious primacy of bread: the Lord’s Prayer included the line “Give us this day our daily bread”, whereas the potato originated in the heathen Americas and was not mentioned in the Bible. Although Frederick did not introduce the plant into his kingdom, he did encourage its cultivation, because of bad cereal harvests and the resulting famines. Frederick’s potato decrees were designed to overcome cultural barriers to its use, as was the measure of growing potatoes in deliberately unguarded fields so that people would ‘help themselves’ to the crop. Frederick’s grave lies a few steps from Sanssouci Palace, whose bright yellow exterior walls are adorned with terms supporting orgiastic pairs of satyrs and nymphs who let vines and swags of fruit trail below them. 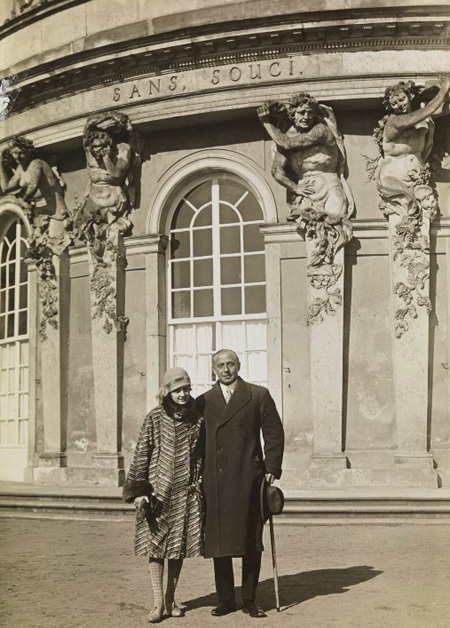 On a crisp cold afternoon around 1923 two smartly dressed visitors stand outside the palace. The fashionable young woman on the left is Melitta Schmideberg (1904-1983), the daughter of Melanie Klein and a child psychoanalyst in her own right. She is arm-in-arm with her husband, Walter Schmideberg. Melitta was professionally concerned with cruelty to children and the association of an adverse early environment with mental illness in the young. Did Melitta know, as she enjoyed the sunshine of Sans Souci (“Without a care”), that the builder of that delightful palace and garden, Frederick the Great, as a teenager was forced by his father to watch the beheading of his closest friend? 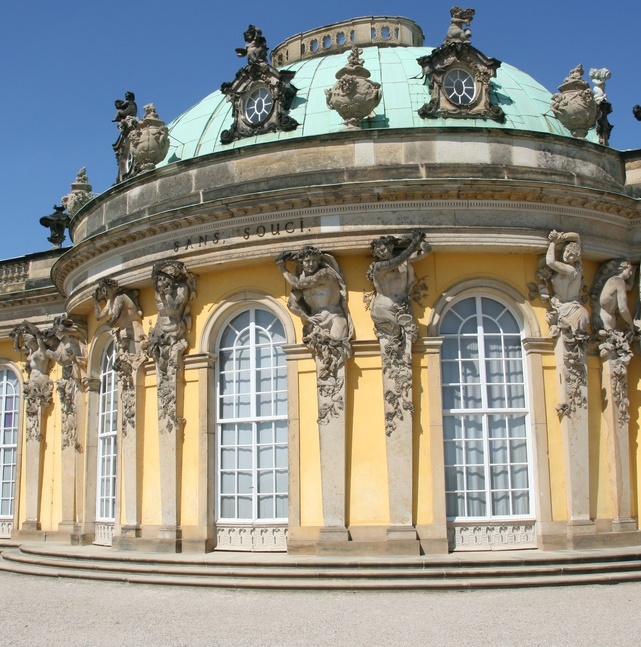 Apart from Sanssouci, Frederick’s other major building at Potsdam was the Neues Palais, or New Palace. A photograph of the palace in the Wellcome Library shows a tiny human figure placed in the middle-ground to give the viewer a sense of the vast size of the building. The photograph itself is mounted on a piece of 19th-century card, inscribed in ink in the lower left corner. It reads: “Offered to Ld. Napier of Magdala in recollection of Sept: 1876. New Palace Potsdam by Victoria P. Crown Princess of Germany and Prussia, Princess Royal of Gt. Britain & Ireland”. So this is a presentation print, given by the English wife of the future Emperor Frederick III of Germany in Potsdam to Robert Cornelis Napier, Baron Napier of Magdala, whose military career culminated in the command of the British Army in India. Napier’s title refers to his participation in a raid to free hostages at Magdala in Abyssinia in 1868, an event that is also commemorated in the names of British streets and pubs. 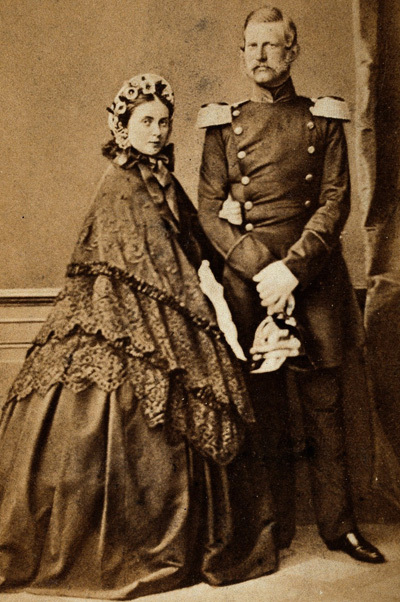 Though Napier’s formal invitation to Potsdam to view the German manoeuvres came from the Crown Prince, it seems likely that his wife was behind it. “Princess Vicky” was proud of her English origins and did not endear herself to her Prussian courtiers by telling them how much better everything was in England. 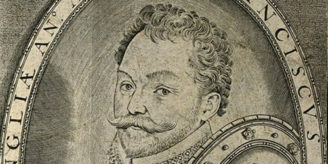 She complained that the Prussian silver plate was thin, the Rubenses and Van Dycks in the Prussian royal collection were all fakes, ladies at court were poorly dressed and unattractive, court culture was philistine and devoid of intellectual and artistic vitality, and German feather duvets were stultifying and unhealthy, and her children were to sleep covered by ‘fine soft English woollen blankets’. Princess Victoria’s husband Frederick III, dubbed “Frederick the Noble” in the title of a notorious book by his British doctor, did not have much time to experience living in the Neues Palais. 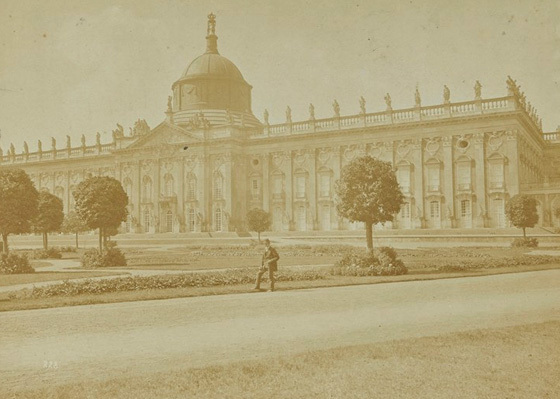 He moved there from Charlottenburg on 1 June 1888, but on 12 June he was driven for the last time through the Potsdam gardens shown in Lord Napier’s photograph, and on 15 June he died.